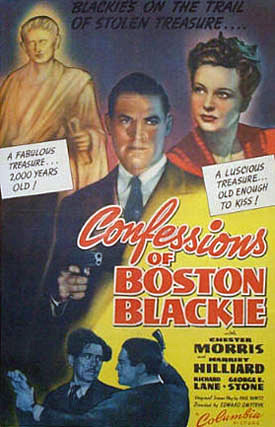 This is the second movie in the Boston Blackie series. Boston Blackie is on the trail of stolen treasure and gets caught up in a crossfire of bullets and women. 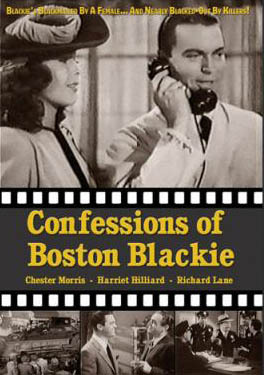 This was the second in the Boston Blackie series, alternate title The Secret of Boston Blackie, and it moves at such a fast pace you don't have time to wonder where the "confessions"" come in. 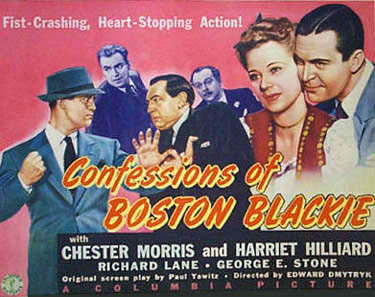 Boston Blackie vs. a ruthless art-smuggling ring. Diane Parrish sells a family heirloom, a statue of Augustus Caesar, to a pair of unscrupulous art dealers in order to raise money to treat her brother, who has been diagnosed with tuberculosis. Blackie gets into trouble when he attends an art auction with his millionaire pal Arthur Manleder (Lloyd Corrigan). It so happens that the auction gallery is run by thieves and they have created a replica of the statue of Augustus Caesar to sell in place of the original at the action. Our heroine, Diane Parrish (Harriet Hilliard), discovers this when she spots the fake at the auction. To keep her quiet, head crook Joe Buchanan (Ralph Theodore) takes a shot at Diane, but though he only wounds her, he kills sculptor, Allison (Walter Soderling). 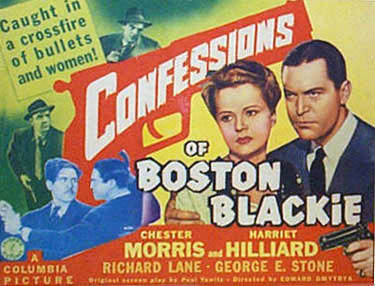 Conclusion-jumping Inspector Farraday (Richard Lane) assumes that Blackie fired the shot, forcing our hero to spend the rest of the film eluding both the police and the criminals. Blackie is on the trail of the valuable sculpture of Augustus Caesar There are the usual brushes with the law, with Morris being suspected of every crime. Great fun is provided by Blackie's constant sparring with bumbling Inspector Farraday. In one scene, Blackie is disguised as a doctor. Farraday complains to him that he has these pains in his fingers occasionally. "Soak them five times a day in boiling water and mustard. And go heavy on the mustard," Dr. Blackie advises. Later when some one asks Farraday what happened to his hand he mumbles, "Oh, a little mustard burn." Highlights include a hilarious fit of rage perpetrated by secondary villainess Joan Woodbury, and an amusing if slightly sadistic running gag involving hapless ice-cream vendor Billy Benedict. Action-packed and well acted. This may not be art but its pace and sense of its own ridiculousness could give some of today's filmmakers a lesson. Al Hill as Police Desk Sgt. In need of funds to send her tubercular brother Jimmy to a sanitarium, Diane Parrish hires art dealers Eric Allison and Buchanan to sell the family legacy, a statue of Augustus Caesar. Unknown to Diane, Allison and Buchanan are crooked dealers who have created a fake statue, which they plan to sell at auction while keeping the original for themselves. Among those attending the auction are Inspector Farraday and Detective Mathews, who have come to protect the artworks, Boston Blackie, a reformed safecracker, and his friend, eccentric millionaire Arthur Manleder, who has come to bid on the statue. As the bidding begins, Diane enters the room, approaches the statue and declares that it is a fake. To silence Diane, Buchanan pulls out his gun and shoots at her. Blackie shoots back at Buchanan, and although his bullet grazes Diane and kills Allison, Farraday has seen only Blackie's weapon and so assumes that he is the gunman. Blackie eludes Farraday and chases Buchanan, who knocks Blackie unconscious and climbs into a secret panel in the back of the statue. Farraday then enters the room, and when Blackie regains consciousness, he arrests him for Allison's murder. After they leave, Buchanan emerges from his hiding place and stuffs Allison's body in the statue, thus depriving Farraday of his corpus delicti. Unaware that Allison's body is hidden in the statue, Buchanan's accomplice, Caulder, the auctioneer, sells the fake to Manleder for $200, and the movers cart it away. When Buchanan learns of the transaction, he insists on recovering the statue to retrieve both his bullet from Allison's body and the combination to the vault from Allison's pocket. Meanwhile, at the police station, Blackie gives Farraday the slip by disguising himself in a uniform that he has stolen from the ice cream man and walking out the door. Upon returning to his apartment, Blackie is greeted by his sidekick, The Runt, and Mona, a showgirl who claims to be Blackie's wife and demands $6,000 in extortion money. To get rid of Mona, Blackie calls Manleder to borrow the money and suggests unveiling the statue at a cocktail party that afternoon. Blackie then goes to the hospital to visit Diane, and when he is denied admittance to her room, he steals another ice cream man's uniform and dons a surgical mask. Thinking that Blackie is a doctor, Diane tells him about Jimmy's tuberculosis and confides that she is selling the statue so that she can afford to put him in a sanitarium. When Diane notices the ice cream logo on Blackie's sleeve, he admits that he is Boston Blackie and asks for time to find her assailant. As Blackie leaves the hospital, Buchanan and Caulder follow him and, to eliminate the only eyewitness to Allison's murder, sideswipe his car and run it off the road. Emerging from the car unharmed, Blackie sends Runt to deliver the $6,000 that he borrowed from Manleder to Diane, instructing him to tell her that it is her insurance settlement. When Mona learns the fate of her extortion money, she visits Diane to demand its return and then informs Farraday of Blackie's deed. Meanwhile, at the cocktail party, Manleder tells Blackie that Caulder has offered him $500 for the statue. Blackie, suspicious, directs him to accept the offer and tell Caulder to pick it up that day. Hoping to trap Blackie, Farraday visits Diane at the hospital and arrests her as a material witness, but she escapes in a laundry hamper and takes a taxi to Manleder's house, where she is met by Blackie. After sending Diane to the safety of Blackie's apartment, he and Manleder follow the movers to Buchanan's warehouse. Blackie enters the building and instructs Manleder to call Farraday if he does not return in twenty minutes. At Blackie's apartment, Diane is greeted by Buchanan, who forces her into his car. When Runt sees them drive away, he realizes that something is amiss and begins to follow them. Arrested for running a red light, Runt is taken to the police station, where he meets Manleder, who has been arrested for loitering outside the warehouse. Meanwhile, Blackie has penetrated the inner depths of the warehouse, discovered the secret subterranean workshop and overpowered Caulder. Back at the police station, Farraday orders the release of Runt and Manleder and then follows Manleder to the warehouse. Before the police arrive, however, Buchanan enters, holding Diane as his hostage. In the ensuing struggle, Blackie knocks Caulder into the statue, sending it crashing to the floor and exposing Allison's body. At that moment, Farraday and his men arrive and Blackie explains that the bullet in Allison's body came from Buchanan's gun. After locating the combination in Allison's pocket, Blackie opens the vault which houses the original statue. Discovering that the gunshots have shorted out the electrical power, thus trapping them in the subterranean chamber, Blackie sends flames shooting through the ventilator, bringing the fire department to free them. After they are rescued, Farraday sheepishly thanks Blackie for saving his life.